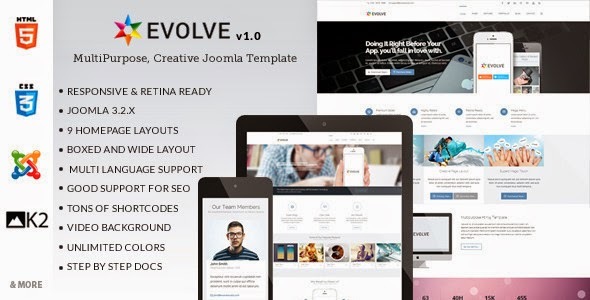 Evolve is a professional multipurpose Joomla template use for any business or portfolio website, it’s fully responsive design and retina ready, looks stunning on any device. It features a very clean and professional design that is perfect for showcasing your work, and have tons of layout possibilities with unlimited variations and colors. Template can be used for any type of website: business, corporate, portfolio, products, marketing, etc. Item Reviewed: Evolve - Multipurpose Creative Joomla Template 9 out of 10 based on 10 ratings. 9 user reviews.